by Chris Woodford. Last updated: July 7, 2018. Stop... start... stop... start. If you make a habit of driving in city traffic, you'll know it can be a huge waste of time. What's less obvious is that it's also a waste of energy. Getting a car moving needs a big input of power, and every time you hit the brakes all the energy you've built up disappears again, wasted in the brake pads as heat. Wouldn't it be good if you could store this energy somehow and reuse it next time you started to accelerate? That's the basic concept of regenerative ("regen") brakes, which are widely used in electric trains and the latest electric cars. What are they? How do they work? Let's take a closer look! 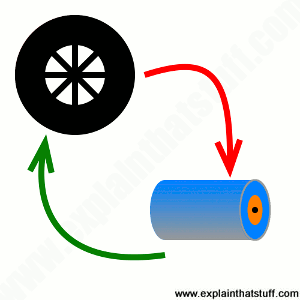 Artwork: The basic concept of a regenerative brake: it stores kinetic energy in a battery (or an equivalent mechanical system) when a vehicle comes to a halt (red arrow); then sends power back to the wheels when the vehicle starts moving again (green arrow). 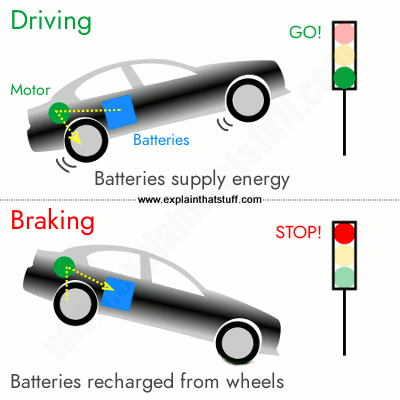 Why does braking waste energy? 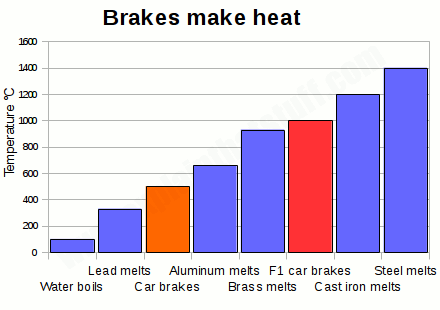 Chart: Friction brakes in ordinary cars (orange) and formula-1 race cars (red) heat up to extraordinary temperatures, wasting huge amount of energy as heat. Car drivers are pretty much oblivious to the energy that braking wastes because driving doesn't require any real, physical effort. Not only that, but car brakes are hidden out of sight, inside the wheels, where you can't see the heat energy they're wasting. But the heat they generate is extraordinary: according to one manufacturer, Brembo, the brakes in formula-1 race cars can heat up as high as 1000°C (1830°F)! How could we make better brakes? Let's try to imagine designing a better braking system for a bicycle by thinking about the science. When we're riding along, our bodies and bikes have kinetic energy (the energy that all moving objects have); when we brake to a stop, all that kinetic energy has to disappear. When we start up again, we need more kinetic energy. An ideal braking system would involve temporarily putting our kinetic energy to one side without throwing it away forever (as we do when we hit conventional brakes)—a way of storing the energy so we can get it back again in the future. 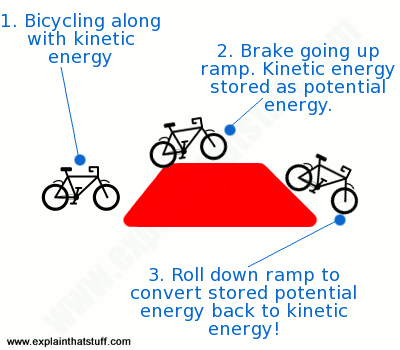 Artwork: Regenerative braking by using a ramp to store kinetic energy as potential energy. How could we achieve this? If you're a cyclist, one easy but rather impractical way would be to carry a gigantic ramp around on your back. Each time you wanted to stop, you could throw the ramp down on the road up ahead of you so you'd bicycle up it and gradually come to a halt, some distance in the air. As you went up the ramp, it would be like going up a hill: your kinetic energy would be rapidly converted into potential energy and you'd slow down and stop. When you were ready to start off again, you'd simply roll down the other side of the ramp and you'd get back (most of) your original energy (the stored potential energy would be converted back to kinetic energy, just as it is when you bicycle down a hill). Okay, this is a little bit bonkers—so what else could we do? If your bicycle has a dynamo (a small electricity generator) on it for powering the lights, you'll know it's harder to pedal when the dynamo is engaged than when it's switched off. That's because some of your pedalling energy is being "stolen" by the dynamo and turned into electrical energy in the lights. If you're going along at speed and you suddenly stop pedalling and turn on the dynamo, it'll bring you to a stop more quickly than you would normally, for the same reason: it's stealing your kinetic energy. Now imagine a bicycle with a dynamo that's 100 times bigger and more powerful. In theory, it could bring your bike to a halt relatively quickly by converting your kinetic energy into electricity, which you could store in a battery and use again later. And that's the basic idea behind regenerative brakes! Artwork: Regenerative braking in a nutshell: Top: When you drive an electric vehicle, energy flows from the batteries to the wheels via the electric motor. Bottom: When you brake, energy flows from the wheels to the batteries via the motor, which works as an electric generator. Next time you switch on the power, you can reuse the energy you stored during braking. Electric trains, cars, and other electric vehicles are powered by electric motors connected to batteries. When you're driving along, energy flows from the batteries to the motors, turning the wheels and providing you with the kinetic energy you need to move. When you stop and hit the brakes, the whole process goes into reverse: electronic circuits cut the power to the motors. Now, your kinetic energy and momentum makes the wheels turn the motors, so the motors work like generators and start producing electricity instead of consuming it. Power flows back from these motor-generators to the batteries, charging them up. So a good proportion of the energy you lose by braking is returned to the batteries and can be reused when you start off again. In practice, regenerative brakes take time to slow things down, so most vehicles that use them also have ordinary (friction) brakes working alongside (that's also a good idea in case the regenerative brakes fail). That's one reason why regenerative brakes don't save 100 percent of your braking energy. How do different vehicles use regenerative brakes? Artwork: How much energy do regenerative brakes save? It depends on the vehicle. Large and heavy vehicles that move quickly (such as electric trains) build up lots of kinetic energy, so they get the best savings. Although they weigh less and go more slowly, delivery trucks that stop and start a lot can also make big savings. Cars vary in what they can save from about 8–15 percent (depending on the car and whether it's driving in city traffic or the open highway). 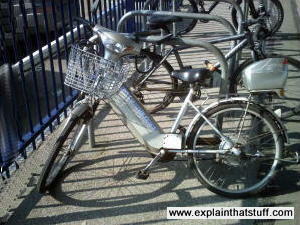 Electric bicycles are light and go fairly slowly, so regenerative brakes achieve little. Data: I've used typical mid-range figures from various sources for trains (https://goo.gl/J3hZXL), trucks (https://goo.gl/6DRvY5), cars (https://goo.gl/UglXby), and bicycles (https://goo.gl/N0w7X3)—but you might well find different values elsewhere. Different vehicles use regenerative braking in different ways. In electric and hybrid cars, the regenerative brakes charge the main battery pack, effectively extending the vehicle's range between charges. Electric trains, which are powered by overhead or trackside powerlines, work in a slightly different way. Instead of sending braking energy into batteries, they return it to the powerline. A typical modern electric train can save around 15–20 percent of its energy using regenerative brakes in this way. Some vehicles use banks of supercapacitors for storing energy instead of batteries. Most electric bicycles do not have regenerative braking and gain little or no benefit from using it. Why? A bicycle is a low-mass, low-speed vehicle, so it wastes much less kinetic energy in stopping and starting than a car or a train (a high-mass, high-speed vehicle). Not only that, but cyclists quickly learn to be smarter in the way they stop and start. Most cyclists use energy really efficiently by coasting or freewheeling to a standstill instead of jamming hard on the brakes, whenever they can. Unless you're doing an awful lot of stopping and starting and cycling at relatively high speeds (if you're a delivery worker, for example), the energy you save with regenerative brakes on an electric bicycle is going to be minimal. Photo: Electric bicycles generally don't have regenerative brakes: unless you do lots of stopping and starting, you can't save enough energy to make them worthwhile. 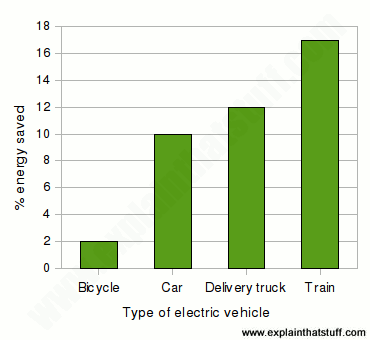 Indeed, regenerative brakes on bicycles can actually end up using more energy than they save. To work effectively, vehicles with regenerative braking systems need to have their electric motors (typically hub motors on electric bicycles) permanently engaged and working as either motors or generators the whole time. That's fine for an electric car, but an electric bicycle needs its motor on only part of the time: some of the time you can happily coast along. Having the motor engaged all the time means the bicycle can end up using much more energy overall, so regenerative brakes can actually end up using more energy than they save! Often, regenerative brakes are added to electric bicycles purely as a marketing gimmick. You might not think	of elevators as electric vehicles, but they certainly are! Otis, a leading maker, introduced the first regenerative elevator, ReGen™, in 2011, claiming to save up to 75 percent of the energy normally used. Where an ordinary elevator wastes braking energy as heat, ReGen feeds it back into the building's power system. Regenerative brakes may seem very hi-tech, but the idea of having "energy-saving reservoirs" in machines is nothing new. Engines have been using energy-storing devices called flywheels virtually since they were invented. Photo: The heavy metal flywheel attached to this engine helps to keep it running at a steady speed. Note that most of the heavy metal mass of the flywheel is concentrated around its rim. That gives it what's called a high moment of inertia: it takes a lot of energy both to make it spin fast and slow down. 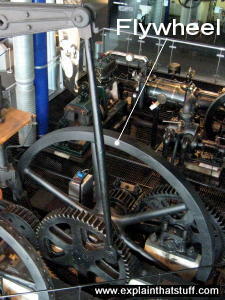 This machine is an exhibit in the engine hall at Think Tank science museum in Birmingham, England. The basic idea is that the rotating part of the engine incorporates a wheel with a very heavy metal rim, and this drives whatever machine or device the engine is connected to. It takes much more time to get a flywheel-engine turning but, once it's up to speed, the flywheel stores a huge amount of rotational energy. A heavy spinning flywheel is a bit like a truck going at speed: it has huge momentum so it takes a great deal of stopping and changing its speed takes a lot of effort. That may sound like a drawback, but it's actually very useful. If an engine (maybe a steam engine powered by cylinders) supplies power erratically, the flywheel compensates, absorbing extra power and making up for temporary lulls, so the machine or equipment it's connected to is driven more smoothly. It's easy to see how a flywheel could be used for regenerative braking. In something like a bus or a truck, you could have a heavy flywheel that could be engaged or disengaged from the transmission at different times. You could engage the flywheel every time you want to brake so it soaked up some of your kinetic energy and brought you to a halt. Next time you started off, you'd use the flywheel to return the energy and get you moving again, before disengaging it during normal driving. The main drawback of using flywheels in moving vehicles is, of course, their extra weight. They save you energy by storing power you'd otherwise squander in brakes, but they also cost you energy because you have to carry them around all the time. Advanced transmissions that incorporate hi-tech flywheels are now being used as regenerative systems in such things as formula-1 cars, where they're typically referred to as kinetic energy recovery systems (KERS). 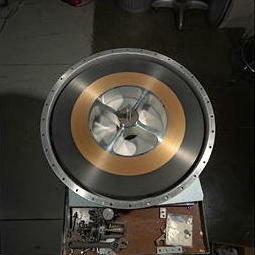 Photo: A magnetic flywheel developed by NASA for space applications. Note, once again, how most of the mass is concentrated around the rim to achieve a high moment of inertia. Photo by courtesy of NASA Glenn Research Center (NASA-GRC). Other kinds of regenerative systems store energy by compressing a gas each time a vehicle brakes—a bit like the way a gas spring in an office chair stores energy when you sit on it. The energy can be released and reused by letting the gas expand (in much the same way as an office chair releases energy when you take your weight off it with the seat-lift lever unlocked). Other systems (including Ford's Hydraulic Power Assist or HPA) store braking energy by pumping hydraulic fluid into a reservoir. Now it might sound incredibly cutting-edge for electric cars and trains to have regenerative brakes, but a little bit of research proves otherwise. The oldest US patent for a regenerative electric train I can find, US Patent 714,196: Regenerative system by Martin Kubierschky of Berlin, Germany, was granted in 1902, and aimed to save a very optimistic 40 percent of the usual power consumption. There may well have been earlier versions, but not that many: regenerative technology seems to date from around the turn of the 20th century. The first regenerative brake on a car is believed to have been developed by Frenchman M.A. Darracq and demonstrated at the Salon du Cycle Show in Paris in 1897. Just like a modern regenerative system, it fed braking energy back to the battery to extend the car's driving range (which was a mere 48km or 30 miles), but claimed a very surprising 30 percent saving in energy (about three times as much as the modern equivalent). However they work, all regenerative braking systems have one thing in common—they help us use energy more wisely. In a world where fuel is becoming ever more costly, and environmental concerns are mounting by the day, that can only be a good thing! Propulsion Systems for Hybrid Vehicles by John M. Miller, Institution of Electrical Engineers, 2010. Includes material on flywheel energy storage in electric vehicles. Modern Electric Vehicle Technology by C. C. Chan and K. T. Chau. Oxford University Press, 2001. Covers all aspects of electric vehicle motors and batteries, with a short final chapter on regenerative braking. The Regenerative Braking Story by Struan Jno. T. Robertson. Scottish Tramway & Transport Society, 2007. A fascinating historical account of regenerative brakes in the UK. In Philadelphia, Batteries on Transit System Power More Than Just the Trains by By Diane Cardwell. The New York Times, January 21, 2016. How SEPTA is using regenerative brakes in trains on the Market-Frankford line in Philadelphia. There's a bit more information about the same scheme in this earlier article, Trains try regenerative braking in Philly by Keith Barry, Wired, 5 September 2012. Smooth ride with Reading's new eco-friendly buses by Jenny Minard, BBC News, 10 December 2010. Hybrid North-American buses hit the streets of Britain, with eco-features (including regenerative braking) cutting fuel consumption by up to 40 percent. Drivers on track for greener trains by Richard Scott, BBC News, 10 October 2009. British railroad train drivers are learning to start and stop smoothly so they can return electricity to the power system more efficiently with regenerative brakes. Emerging technologies for the supercar by Dan McCosh. Popular Science, June 1994. A great article from Pop Sci that explains why (and how) conventional cars waste so much energy. There's a feature within the article devoted to flywheels. The Magic of Tesla Roadster Regenerative Braking by Greg Solberg, Tesla Firmware Engineer, June 2007. US Patent 4,908,553: Magnetic regenerative braking system by Lyle O. Hoppie, Donald Speranza, Eaton Corporation, March 13, 1990. A regenerative brake in which excess kinetic energy is stored magnetically, in an inductor. US Patent 1,245,398: System of Control by Norman Storer, Westinghouse, November 6, 1917. An early regenerative brake for an electric train. US Patent 714,196: Regenerative system by Martin T A Kubierschky, November 25, 1902. The earliest regenerative braking patent I've found covering electic trains. ReGen is a trademark of Otis Elevator Company.